Royal Panda added two more software providers, Thunderkick and ELK Studios. Two smaller slot game providers, but with some very cool games. Some very popular titles are Bloopers and DJ Wild by ELK and The Rift and Arcader by Thunderkick. To celebrate these new additions Royal Panda also runs a fun little promotion where you are able to collect €40,- in bonuses. The promotion runs from July 8th until July 10th. Play at least €50,- on The Rift slot game by Thunderkick and you will receive a €20,- bonus. Play at least €50,- on Bloopers slot game by ELK and you will receive another €20,- bonus. The bonus will be added to your account between July 11th and July 14th. You will receive €5,- a day for each slot game, so play them both and you will get €10,- each day, for four days. A nice promotion to give the new slot games a try. 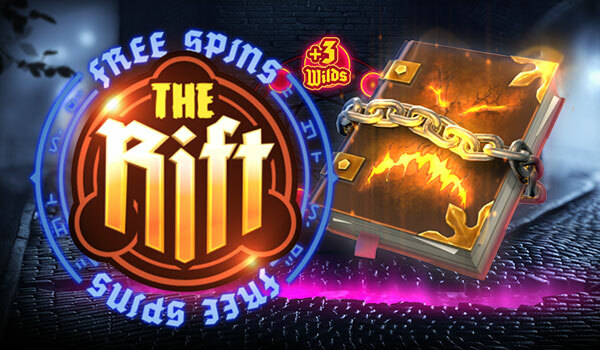 I personally love The Rift slot game. A really cool looking game that comes with sticky wilds and re-spins and can payout some big wins. If you sign up at Royal Panda you will receive 10 free spins on Starburst, no deposit needed. And on your first deposit you can claim a 100% bonus up to €100,-.